Well this parade entry started as Chesty Bond concept however this had already been done in a previous year so it became a tribute to Dame Joan Sutherland. The premise being that Chesty Bond was Joan's love child based on the similarity of the prominent jaw line. 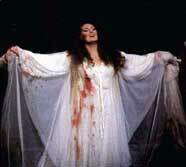 Dame Joan was realised in her most celebrated role, that of Lucia di Lammermoor. This group was sponsored by Noel and Jason of Kenah Antiques that was once on King Street, Newtown. Mardi Gras parade start area, February 1994.